WHEN the first series of “Whistle-binkie ” was issued in 1832 from David Robertson’s shop at the foot of Glassford Street, then the favourite literary howf of Glasgow, its best and most characteristic contributions were from the pens of William Motherwell and Alexander Rodger. It was the pawky humour of pieces like Rodger’s ” Robin Tamson’s Smiddy” and “Behave yoursel’ before folk,” contrasting with the pathos of poems like Motherwell’s “Jeanie Morrison” and “My heid is like to rend, Willie,” which struck the public taste so strongly, and made the curious poetic venture a success. Not less striking was the contrast between the characters, opinions, and careers of the two contributors. the making of poetry. Perhaps his earliest effort was a poem, “Bolivar,” written on seeing in the Glasgow Chronicle, in 1816, that that patriot had set free seventy thousand slaves in Venezuela. The peculiarities, also, of the Highland members of his volunteer regiment furnished him with subjects for several satirical pieces. This furor scribendi however, was presently to bring him to trouble. 1816-1820 were the Radical years, when, amid the distress following Waterloo, political agitation rose to a dangerous pitch. In 1819 The Spirit of the Union, a strongly political paper, was started in Glasgow by Gilbert Macleod, and Rodger became sub-editor. But after the publication of the tenth number Macleod was arrested, tried, and sentenced to transportation for life, and Rodger became a suspect. In after days he used to tell how, when his house was searched for seditious publications, he placed his Family Bible in the officer’s hands, that being, as he said, the only treasonable book in his possession, and he pointed to the chapter on kings in the second book of Samuel. Nevertheless, on the appearance of the famous “treasonable address” on the walls of Glasgow, signed by a “Provisional Government,” Rodger was actually arrested, and imprisoned for eleven days in Bridewell. There, in solitary confinement, he consoled himself, and aggravated his gaolers, by singing his own political compositions at the loudest of his lungs. In 1821 he obtained employment as inspector of cloths at Barrowfield Printworks, and during his eleven years in that situation he composed most of his best pieces. At the same time the poet’s political sympathies were by no means hid under a bushel. When George IV. , in 1822, visited Edinburgh, an anonymous squib from Rodger’s pen, “Sawney, now the King’s Come,” appeared in the London Examiner, creating much speculation in the mind of the public, and no little annoyance to Sir Walter Scott, whose loyal “Carle, now the King’s Come,” had appeared simultaneously. And when Harvie of West Thorn blocked up the footpath through his property by Clydeside with a wall, it was by Rodger’s strenuous energy that the public movement was directed which vindicated the right of way. 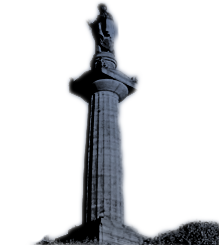 He found a place shortly, however, as reader and reporter on the Glasgow Chronicle; and a year later, on John Tait starting a Radical weekly, the Liberator, Rodger became his assistant. Tait died, and the paper came to grief, but in a few months the poet found a place in the office of the Reformer’s Gazette, which he kept till his death. 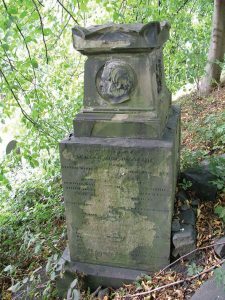 In 1836 some two hundred of his fellow-citizens entertained him to dinner and presented him with a silver box full of sovereigns “a fruit not often found on the barren slopes of Parnassus.” He died 26th September, 1846, and was buried near William Motherwell in Glasgow Necropolis, where a monument marks his resting-place [Compartment Mnema]. On hearing of his death the Scotsmen in Cincinnati collected and sent to David Robertson, the publisher, a sum of £12 as a gift to the poet’s widow and children. 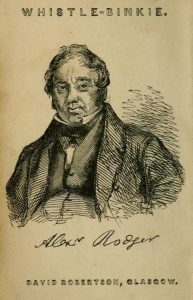 Rodger’s first avowed appearance as an author was in 1827, with a volume, “Peter Cornclips, a Tale of Real Life, and Other Poems and Songs.” In 1838 he published another volume of “Poems and Songs, Humorous and Satirical “; and in 1842 “Stray Leaves from the Portfolios of Alisander the Seer, Andrew Whaup, and Humphrey Henkeckle” these being the nommes de plume above which the satirical contents had appeared in periodicals. Since then select editions of his poems have been edited by Mr. Robert Ford in 1896 and 1902. But the poet’s name is chiefly associated with “Whistle-binkie,” in which his best pieces appeared, and of which, after the death of Carrick in 1835, he became editor. MONUMENT TO THE MEMORY OF THE LATE MR. ALEXANDER RODGER. At Glasgow, 26th September, 1846. In diving deep, or soaring high. The inscription was penned by Mr. Kennedy, author of “Fitful Fancies,” and the concluding lines of poetry are from an Ode to Tannahill, by Rodger. The design of the monument is exceedingly chaste, and the execution of the likeness does much credit to Mr. Mossman— Guardian.